The government is set to unveil a shake-up of fixed-odds betting terminals (FOBTs) shortly, gaming machines that exist in thousands of bookmakers across the UK. Critics call them the "crack cocaine" of the betting world. The industry says they are a vital - and perfectly legal - part of the sector that create jobs, profits and tax revenue for the government. But with punters able to wager up to £100 every 20 seconds, there is concern about the social, mental and financial cost. Cutting the bet-per-spin to about £30 had been suggested. But now, it seems, the government is considering a limit of £2, with reports that the Treasury backs the idea. Here, four voices from both sides outline their arguments. Philip Bowcock is chief executive of William Hill, which makes just over half its retail revenues from gaming machines. He says a £2 FOBT limit will have a devastating impact on the High Street betting industry, with up to half of Britain's betting shops facing threat of closure and about 20,000 jobs going". The 8,000 bookies in the UK employ 50,000 people, pay £1bn in tax, and £80m to local authorities in rates. "And when you also consider the knock-on impact on suppliers and horseracing, then the jobs picture is even worse," Mr Bowcock adds. Bookmakers contribute about £270m to the racing industry. Research by KPMG estimates a £2 limit would cut revenue for the Treasury by £1.1bn over three years, an annual loss of £45m to local authorities and £50m to British racing. A big concern for the industry is that a £2 limit is being considered despite the government's own advisers pointing to a "more proportionate response". That is a reference to reports from the Responsible Gambling Strategy Board and the Gambling Commission. "Government cannot avoid the loss of High Street jobs where businesses are failing. But they can avoid a decision - not based on evidence - that will put thousands of people out of work." Matt Zarb-Cousin is now a spokesman for the Campaign for Fairer Gambling, but at one time was consumed by FOBTs. He skipped college to visit betting shops, and sold possessions on eBay to fund his addiction. And he came close to killing himself. 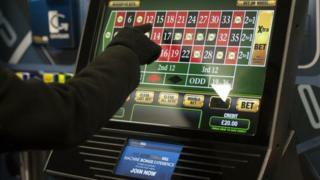 "It's no exaggeration to call FOBTs the crack cocaine of gambling," he says. "If we had a gambling product classification, similar to that of drugs, FOBTs would be class A." The speed with which gamblers can lay a bet - every 20 seconds - and the maximum size of the stake - £100 - make FOBTs dangerously attractive, he says. "In the midst of my addiction, I deluded myself that I was one big win away from solving the problems the addiction had caused, which only perpetuated the harmful behaviour. "I tried to self-exclude from betting shops, but the high staff turnover meant there was no chance I would be recognised and asked to leave," Mr Zarb-Cousin says. Drug addiction is neurologically similar to gambling addition, he says. And like some drugs, some types of gambling are more addictive than others. Research by Landman Economics found that there were more than 230,000 FOBT sessions in one year where an individual lost more than £1,000, he says. And with the average FOBT user losing £192 a month, only by cutting the maximum stake to £2 will the government eliminate large-scale losses of more than £100 a session. Cutting FOBTs stakes from £100 to £2 is not only "disproportionate", argues Malcolm George, chief executive of the Association of British Bookmakers, but could also "create a variety of unintended and potentially harmful consequences". He cites the Gambling Commission's own advice that "the underlying causes of gambling-related harm are many and complex in nature" and that a very low FOBT stake limit would make it a "softer" form of gambling than is available in arcades, bingo halls and pubs. The latter, he says, are less tightly regulated than betting shops. "A £2 stake on a FOBT doesn't bring the machine into line with other gaming machines on the High Street," insists Mr George. "What it means is that the most you could bet would be £6 per minute on a FOBT, but you could bet four times as much per minute on a pub fruit machine (£24) or eight times as much on an arcade machine (£48)." A £2 stake limit means "customers will simply go to other venues with fewer controls and move online". There are other ways to control machine betting, including better use of technology such as algorithmic-based warnings and new ways to block debit card use. He also supports tougher rules on advertising, which he says is more of a concern to the public than gaming machines: "Parents are far more worried about their children seeing online gambling ads during football matches." Millionaire Derek Webb was a professional poker player for decades and knows the gambling industry from the inside. He's also the founder and funder of Stop the FOBTs and the Campaign for Fairer Gambling. He says the "once-a-problem-gambler, always-a-problem-gambler" attitude ignores that some forms of gambling are more addictive than others. "Every day, vulnerable persons entering betting offices for the first time are being exposed to the evidentially proven most addictive form of gambling - FOBTs." He's not anti-gambling, but Mr Webb says the "only purpose of legalising gambling is to ensure it's taxed and properly regulated. In order to do the latter, regulation has to take into account the impact of stake, speed of play and game design in inducing and exacerbating gambling related harm and crime." Bookmakers introduced FOBTs on a false pretence, he says, claiming it was akin to betting on a horse race. "But they're nothing to do with betting - they're gaming machines that facilitate high stakes roulette in easily accessible premises." Under the 2005 Gambling Act, Britain became the first - and still is the only - country to permit this form of gambling in High Street venues, he says. The Act says gambling must be fair and open, not associated with crime, and not harm the young or vulnerable. "FOBTs are irreconcilable with the licensing objectives. That evidence is now overwhelming."